ABC, home of the beloved Christmas classics A Charlie Brown Christmas, How the Grinch Stole Christmas and others that have delighted generations, adds an instant classic to its holiday repertoire in November sweeps â€” DreamWorks Animationâ€™s Shrek the Halls, a half-hour of entertainment starring Americaâ€™s favorite ogre and his friends and featuring the voices of Mike Myers, Eddie Murphy, Cameron Diaz and Antonio Banderas. Just when Shrek thought he could finally sit back, relax and enjoy his happily ever after with his new family, the most joyous of all holidays arrives. 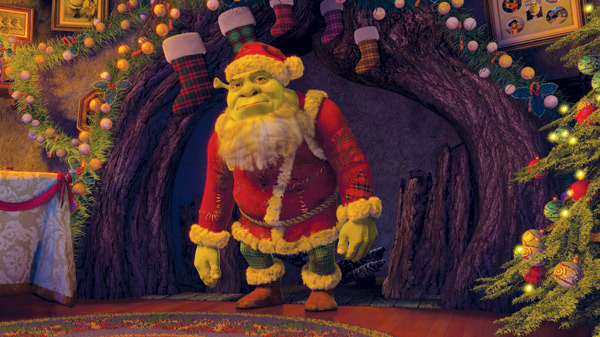 It’s Christmas Eve and everyone is filled with holiday cheer — except for Shrek. He isn’t exactly the picture of yuletide joy, but for the sake of Fiona and the kids, he tries to get into the spirit of things as only an ogre can. Unfortunately, everyone seems to have their own ideas about what Christmas is all about, so when Donkey, Puss In Boots, Gingerbread Man and the whole gang try to join in on the fun, Shrek’s plans for a cozy family celebration end up spiraling into one truly unforgettable Christmas. DreamWorks Animationâ€™s most successful franchise to date, the Shrek series began with the groundbreaking, Academy AwardÃ¢-winning feature, Shrek, based on the popular childrenâ€™s book by William Steig. The sequel, Shrek 2, proved even more successful at the box office, practically doubling the worldwide box office take of the original to become the third-highest-grossing film of all time. Shrek the Third, the latest installment, recently wrote box office history by scoring the biggest opening weekend ever for an animated film, and has grossed nearly $800 million at the worldwide box office to date. Shrek the Third will be available on DVD and HD-DVD on November 13, 2007. Shrek the Halls is written by Gary Trousdale & Sean Bishop and Theresa Cullen & Bill Riling, produced by Gina Shay and Teresa Cheng and directed by Gary Trousdale. Executive Producer is Aron Warner.